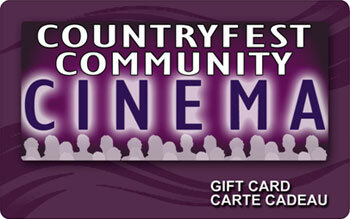 Countryfest Community Cinema Gift cards make a great gift for any occasion. Everyone loves movies!! Gift Cards are available through our box office or concession during operating hours. Cards can be loaded and reloaded with amounts from $10 to $250. Please call 204 638 5319 during office hours for any questions, concerns, or to place large orders (shipping and handling charges may apply). Present gifts card to pay for products or services at Countryfest Community Cinema. Cards are non refundable. Not redeemable for cash and cannot be replaced if lost or stolen. This gift card is subject to the conditions of the Countryfest Community Cinema Gift Card Program. Card is reloadable at anytime. NO VALUE UNTIL ACTIVATED BY a Countryfest Community Cinema staff member.